Sold about 3,000 acres during 2017!! - Land Buyers - Looking to purchase land for sale in NC and need an experienced land agent to guide you? Sellers pay our fee in most cases, and we have many years of experience assisting landbuyers with identifying properties that meet their requirements, and guiding them every step of the way through closing. Whether you are looking for investment property, NC Mountain Land for outdoor recreation, or looking for the perfect tract of land for retirement, at NC Mountain Land LLC we have the expertise to help you find land that is right for you. Call Chris Breden today at (336) 927-4261! Land Owners considering selling property will appreciate knowing that we list large tracts of land, and we represent sellers in the sale of their property while guiding landbuyers through the purchase process, all the way through closing. Property owners will also be pleased to know that we are land brokers specializing in land only, so we are able to understand even the largest tracts of land using the right tools for the job, rain or shine! Land for Sale in NC -It's in demand! If you're thinking of selling land in NC, you're probably wondering who would ever be interested in buying land in NC, especially when you own a large tract of land. 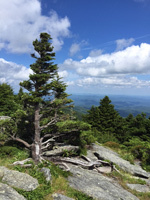 Will it be a rich out-of-state developer purchasing your NC mountain land property? Or, will it be a local individual or family looking for a place to build a luxury home or cabin? It may surprise you to know that our best buyers of land for sale in NC are North Carolina families looking for investment and recreational land. Specifically, we deal mostly with families and individuals looking primarily for a sound investment where they can park some of their wealth, but can also enjoy with family and friends. Many of these investors enjoy the outdoors, which is probably the reason they opted to purchase land for sale in NC to begin with. Regardless of whether you're ready to sell now, or 5 years from now, you want to be sure to do the right things that will either improve your property value, or improve the appeal that will make it possible to find a buyer in the least time possible. There are a number of low-cost ways to improve the aesthetic value of your property. We can help you identify ways that will make your NC mountain land easier to show, and will also make it easier for a buyer to say, "I'll take it!". Investors can take advantage of land for sale in NC in a number of ways. Some may choose upfront to cash some of the property's value by harvesting some, or all of the merchantable timber, while others may plan on holding the property for many years into the future. Making improvements to some of the best areas will not only increase the aesthetic value and appeal of the property, but will also make it possible to enjoy some highly coveted outdoor recreation opportunities with friends and family. Diversifying your investment portfolio with land is always a good idea. Investing in land for sale in NC makes especially good sense since NC land historically has had good demand, and commands greater prices than land in adjoining states. Buyers looking to purchase land for sale in NC usually request popular features, such as high elevations for cooler Summer temperatures, trout streams and other water features, areas with gentle slopes for a cabin or for gardening, trails for horseback riding, hiking, or ATVs, and nice views are always a plus. We offer land for sale in NC across a number of counties from the High Country to the Foothills, offering variety in terms of the features listed above. One thought that prospective land buyers must keep in mind is that there is no perfect property out there! If you plan to begin your search for land for sale in NC, make a list of must-have features, and another list of bonus features to help you narrow down the list of likely suitable properties. Doing so will help to ensure that you do not become frustrated, disappointed, and confused during your search for NC mountain land. We've helped a multitude of landbuyers through their search process and all the way through Closing on their purchase of land for sale in NC. Contact us if you're ready to begin your quest for the perfect tract of land for you!